First Movie Trailer Arrives for Gus Van Sant’s Promised Land. Matt Damon, John Krasinski and Frances McDormand star in the fracking-for-natural-gas drama based on a story by author Dave Eggers (Away We Go). Watch the movie trailer for Promised Land below. In the film, an ace corporate salesman for a natural gas company experiences life-changing events after arriving in a small town, where his corporation wants to tap into the available resources. 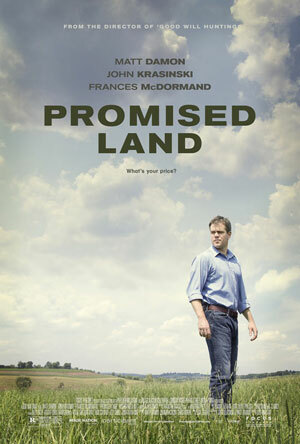 Promised Land is the new contemporary drama directed by Gus Van Sant (Good Will Hunting, Milk). Matt Damon plays Steve Butler, an ace corporate salesman who is sent along with his partner, Sue Thomason (Frances McDormand), to close a key rural town in his company’s expansion plans. With the town having been hit hard by the economic decline of recent years, the two outsiders see the local citizens as likely to accept their company’s offer, for drilling rights to their properties, as much-needed relief. What seems like an easy job for the duo becomes complicated by the objection of a respected schoolteacher (Hal Holbrook) with support from a grassroots campaign led by another man (John Krasinski), as well as the interest of a local woman (Rosemarie DeWitt). Promised Land explores America at the crossroads where big business and the strength of small-town community converge.